Microsoft has completed a spring tune up on their adCenter platform recently. The upgrade makes use of several new features, including more control over targeting, bidding, and ad distribution, and other elements of campaign management. Apply customer targeting and set incremental bids at the campaign level. Easily set default keyword bids for your ad groups, and use nondefault bids to help advance high-profile keywords. Use improved keyword research options to research keywords, set bids, and add your new keywords to your ad group in adCenter online. Set city and state targeting for multiple campaigns and ad groups, in adCenter Desktop Beta or in adCenter online. 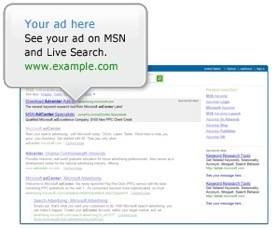 Microsoft also announced that their Content Ads program is now officially out of beta. I’ve written in the past my preference over adCenter as opposed to Google AdWords, and these new features reaffirm that feeling. However, many marketers may disagree with that statement, but everyone is different and knows what works best for their affiliate marketing needs.